My brother proudly shows me his work bench, chisel sets and other thoughtfully organised tools. He’s recently cleared a space in the garage so he can make things. He’s always liked making things. This hobby was temporarily interrupted by having a job selling electronic stuff in Asian countries to make big money. Now he’s changed jobs, downgraded his income in favour of having time to do stuff he loves. On a budget. I’m now in full audience mode. Something my father and brother have taught me to do well. I’m mainly here to make appreciative noises and ask questions that help them tell their stories. I like the role, its fun to watch people talk about the things they love, dad and his Pylons, Bros and his making things. 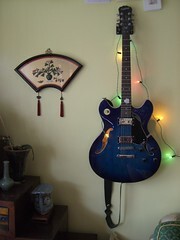 This is the first Guitar he’s made from scratch. He looked less happy when he realised he wouldn’t be able to make a living by making guitars because it was so time consuming. 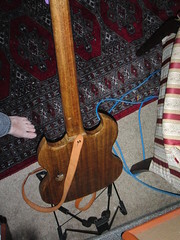 I remember the first (Bass) guitar he renovated in his teens and sold for a profit over the purchase price and materials. Not profit on the labour. 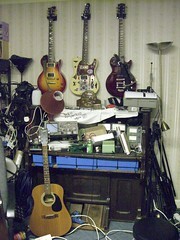 His home has always been full of guitars he’s bought, renovated or upgraded. 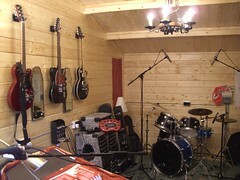 His garden shed is a production studio for local bands, often full of people playing his instruments. for noise pollution…. …my Brother may get an ASBO…. This scribble was published on Monday, September 13th, 2010. You can follow any banter on this scribble with the RSS 2.0 feed. You can leave a response, or trackback from your own site. 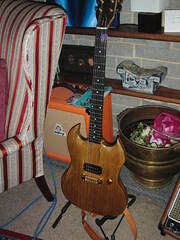 An oak guitar! Now, that’s impressive. complaints have been for times when my brother has been out. Suspicion falls on his children and their friends. As for soundproofing – they open the windows to keep cool, it gets HAWT in there. So they need a cooling air conditioner and responsible children…. Can he get some sound proofing in the shed? Hope he doesn’t get into too much trouble with the environmental health peeps. It looks like an amazing collection of instruments.